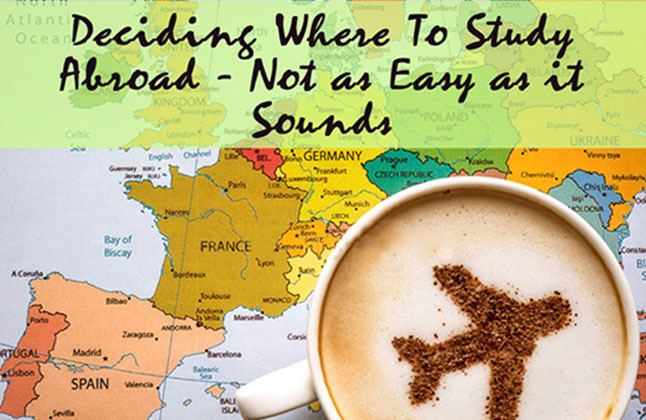 There are so many destinations to choose from when deciding where you want to study abroad that it can often be an overwhelming choice. It might be best if you first narrow down the type of location that interests you the most, and then make your decision. With so many study abroad program types and destinations available to you, it can be difficult to decide where to start. This is probably the most obvious of the challenges of studying abroad. Overcoming a language barrier may mean you're struggling to learn a new language pretty much from scratch, or it could just be that you thought you were fluent, but find you're unable to understand the strong local accent. Even if you're studying in a country where you speak the same language, there are other hurdles to clear. So the words that students use are going to be difficult to learn, but the language barrier problem also goes away pretty quickly, once you're immersed. Now that you have decided where and when you want to study abroad, it's time to find a suitable programme. From summer study abroad trips to semester-long and full academic year programs, there are several types of programs to choose from as you decide which is best for you. As you research your options, it's important to talk directly with the program(s) of interest to learn more about what they offer, at what cost, and which amenities are or aren't included such as airport pick-up, onsite orientation, housing, etc. As a foreigner, you do not know the local culture and all those unwritten rules of your host nation. Let's get accept one thing: you will make mistakes, and many may be awkward. Don't be embarrassed; learn from cultural misunderstanding and don't make them again. An easy way to avoid many cultural misunderstandings is to observe what others do, and how they do it. If in any doubt, just ask! You'll find most people are happy to talk about their customs, and will enjoy sharing their insider knowledge with you. From university applications, to finding a place to stay and identifying the social norms, we have all been unsuccessful in some if not all of these respects. But when you push through the challenges, everything will work out - and if nothing else, you will have lots of stories to tell. Meet with your academic advisor to ensure you can stay on track to graduate on time, plan the coursework you need to take before you go abroad, the coursework you should save and take while abroad and the coursework that you will need to take after you return. Talk with your parents about why, when and where you want to study abroad. Deciding to study abroad is often a family decision, and having an open conversation with them can help both you and them plan the best study abroad trip for you as possible. It's important to come to the conversation prepared with your points, and be ready with answers to their questions. Regardless what country you are from, and what country you are going to, it's almost certain that you'll end up feeling like an 'outsider' at least some of the time. You may find yourself wondering why your espresso always seems to cost more than the locals', or why everyone's laughing, when you didn't realize anyone had told a joke. In most countries it's unlikely that you'll be deliberately made to feel uncomfortable or unwanted, but it can still be tiring at first, trying to get to grips with new cultural norms. Don't let this discourage you. Virtually everyone I have ever met while studying abroad has been very encouraging and friendly, and while I may never become truly "one of them", eventually this problem becomes smaller and smaller. "I had a very nice experience with Edwise even though I was late for admissions but because of the excellent help by Edwise made it possible for me to take admission in September intake. Thanks a lot for the efforts." "My experience with Edwise is very good. Edwise gave me proper guidance regarding colleges and various courses which are very helpful in future opportunities. Very well organised method regarding explanation of processes which gave perfect knowledge." "Truly exhilarating! Not only my counselor was warm and approachable, in her hands I knew my application was in the best place! Will cherish the memories of her guidance and a huge thanks to her for her immeasurable help. Keep up the great work! I was totally at ease and so was my mother as soon as we signed up with EDWISE. 10/10 would and have recommended to others." "Edwise has done a wonderful job and I thank each person at Edwise who has helped me get here in time. I am absolutely overwhelmed and appreciate the support provided by you people. It was a wonderful experience interacting with everyone at Edwise. I shall definitely recommend anyone who wants to study abroad to come to Edwise. I got the right suggestion at the right time from everyone including my Academic Counsellor to my Visa Counsellor & due to their support & hard work I am here at my dream destination." "The experience was both fantastic and an enjoyable one. My counsellor was very supportive with me at all times and helped me at every single stage. Though I applied to Pittsburgh and they do not have any agents anywhere in the world, still I received enough help from my counsellor as much as possible in whatever aspect they could help me out in, starting from application tips till the final stages of my VISA application. In a nutshell, the help I received from Edwise Kolkata was quite invigorating." "Right from documents collection, application process, visa counseling-mock test, my counselor helped me for every single thing with whole heart and lots of efforts. I wasn't expecting a good university for myself but I got it because of Edwise. I am happy with the service provided by Edwise. My experience was excellent.Best thing about Edwise is one to one attention which helped me a lot. I will suggest all my juniors and friends who want to study abroad."